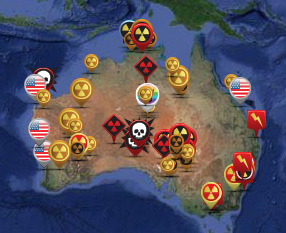 A delegation of Australian nuclear free campaigners has travelled to Canada to present at the World Uranium Symposium being held in Quebec City, April 14-16. The group includes representatives from Aboriginal communities impacted by nuclear projects and national environment groups. Canadian company Cameco is behind plans for two controversial uranium mines in Western Australia – Kintyre in the Pilbara and Yeelirrie in the Northern Goldfields, which will be at the forefront of issues raised by the Australian delegation alongside the emerging issues with the South Australian Royal Commission into the nuclear industry. The Symposium will examine the human and environmental impacts of the industry, with the Australian delegation presenting sessions on the nuclear fuel chain legacy in Australia, Indigenous Rights and the nuclear fuel chain and the intergenerational health impacts of nuclear power and nuclear weapons. The Symposium will be followed by the 5th International Uranium Film Festival, which will feature the Australian film “Protecting Manuwangku”, documenting the successful struggle of Warlmanpa Traditional Owners to stop a national radioactive dump at Muckaty in the Northern Territory. Follow the tour via the ANFA website and via twitter on #uranium2015.